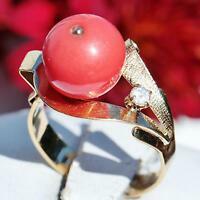 Mediterranean CORAL , Thai Black SPINEL RING in Plat / Sterling Silver 0.90 Cts. Mediterranean CORAL , Thai Black SPINEL RING in Plat / Sterling Silver 1.60 Cts. Details about Mediterranean CORAL , Rhodolite GARNET RING in Plat / Sterling Silver 1.70 Cts.